Calendar constructed to allow: one week mid-term break in Term 1; five day mid-term break in Term 2 (to include Lunar New Year’s Eve); 3 week break at Christmas; and 2 week break at Easter; year end in June. ESF CPD previously scheduled for 1 Feb 2019 for all schools will be front loaded into August 2019, date to be confirmed. Additionally, all schools will need to identify four further CPD days for the current year. 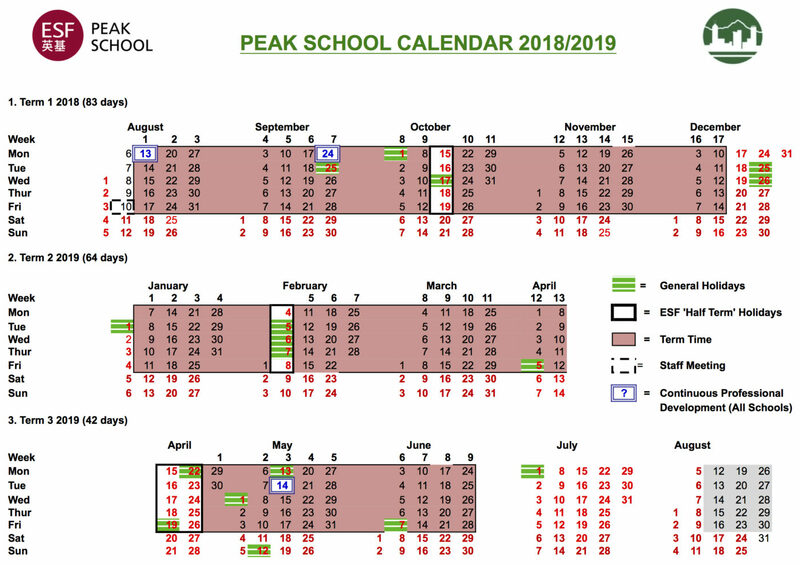 *Peak School have identified 3 CPD Days with one more to be confirmed*. The start date for 2017/2018 shown for indication only. We recommend individuals and families avoid making travel plans for August 2018 until the school start date and back to school work date are confirmed.